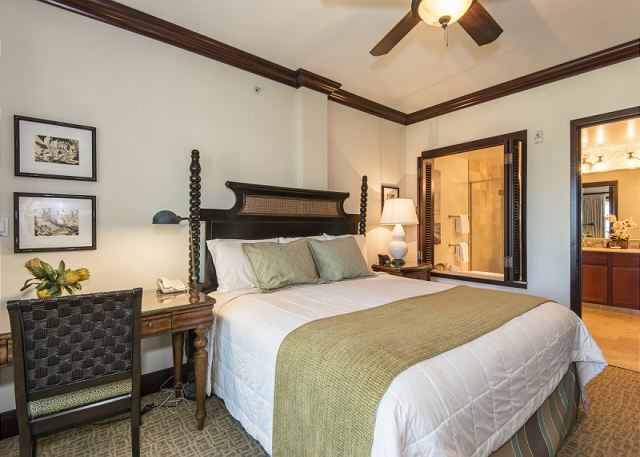 Featuring two king bedrooms, this suite can comfortably accommodate 4 people. The stylish interior includes a stately kitchen with a Wolf glass cooktop & oven, Sub-Zero refrigerator, GE profile microwave, Fisher Paykel dual dishwasher drawers, granite counter tops, African Mahogany cabinets, three full bathrooms with Peruvian Travertine stone surrounds and soaking tubs. Enjoy the clean design and convenient location, with the beach and boundless Kauai adventures just beyond your private lanai. Wow! Our vacation went off without a hitch. Kauai Exclusive made it all very easy. Simple instructions about checking in and out, everything taken care of. Pictures do not do this location justice. Great, quiet, well maintained place to stay. Wonderful for families. It’s central location is nice for those that want to spend time exploring both sides of the island. We spent time in Poipu, Waimea Canyon, Boat tour to Napoli Coast, Hanalei Bay and Princeville and surfing along the coast. Great restaurants nearby as well as a grocery store within walking distance. We ate all of our breakfasts in rather than spend time and money at a restaurant. The resort had grills that many used for lunch or dinner. We would stay here again! Our extended family - 13 of us -- enjoyed a week together in several condos. 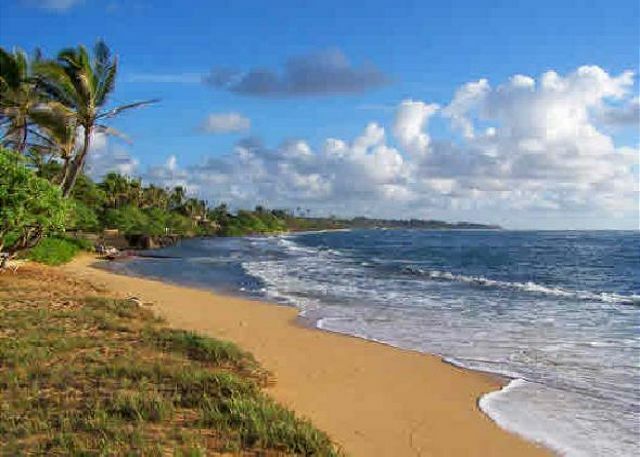 We love beautiful Waipouli which has something for everyone! It is child-friendly, safe, pretty with gorgeous views, and convenient to the ocean and creature comforts like stores and restaurants. We will definitely return. this property looked exactly like the picture, well furnished and maintained. It was so easy to book and management is great about responding to questions. Highly recommend. I think this is the third or fourth time we have stayed in H-302. We love the location in the complex. The staff at Kauai Exclusive was great. Good communication. Lovely unit. We had such a great time staying at Waipouli! This unit was perfect for our family of 5. My husband and I enjoyed breakfast and a bit of work every single morning and evenings reading a good book on the beachfront lanai It was everything we had hoped for! Any questions we asked were immediately answered and taken care of my Kauai Exclusive Management. We were even allowed to have a late check out which was SO greatly appreciated! Can't wait to stay here again! 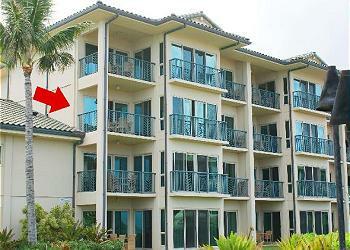 We recently stayed at H302 at Waipouli Beach resort. The condo was large and lovely with an amazing view of the ocean and resort. The unit was quite clean, although it does show some wear from all the saltwater (ceiling fan, bedskirt). The property is very centrally located and the kitchen was well stocked. We would highly recommend this resort. In short, I had done extensive research on where to stay with my wife and two toddlers for weeks prior to our trip. When looking at the north and south shores, this seemed to be perfect as we wanted to see both. It worked out well. As for the unit, everything was top notch. I've stayed a 5 star resorts and the room, bathrooms, and pool area measure up favorably. I would book here again without hesitation. Everything about this was professional. The property was clean and well maintained. The location was very convenient. The view was amazing. It's about the view !! Thoroughly enjoyed our family's stay in H302. As I stated in my title, it's all about the view. You're not stuck in a box with no visual enjoyment. Grab your coffee or cocktail, kick back and relax!! This is the 2nd time we have stayed at Waipouli Beach Resort H302. 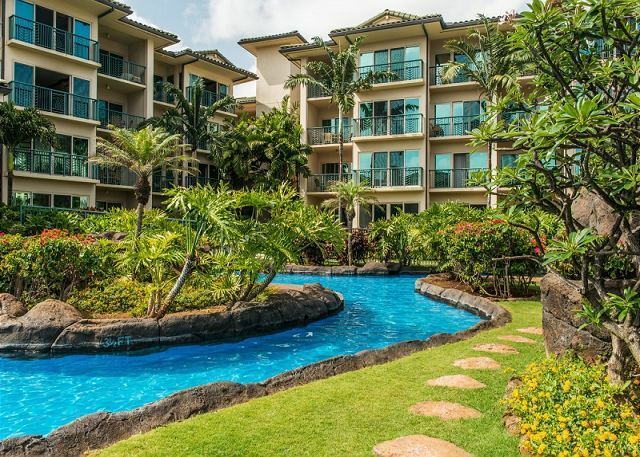 You couldn't ask for a better location.This is a corner unit so you can see both the ocean directly but also the pool & it's beautiful maintained landscaping. They also have a restaurant located on the premises. There is a strip mall across the street with a Safeway & a McDonalds. This is a 5 star place !! We love the roomy clean condo and great location. The beaches aren't the best, but are still nice to look at and the ocean breeze is a plus. My daughter always loves the water slides. 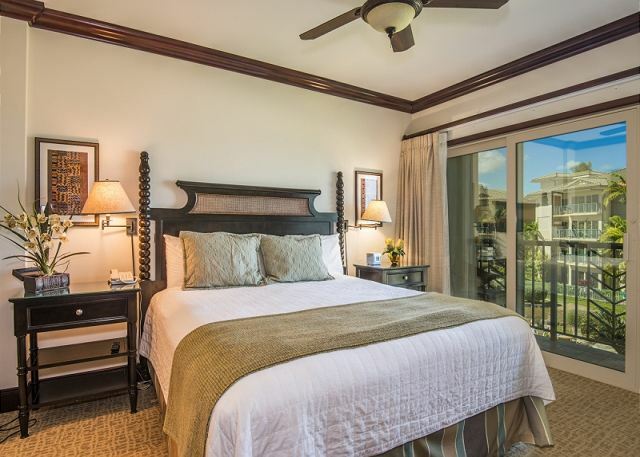 Best view from this condo is from the master bedroom or when on the lanai. Staff was quick to fix any problems with condo. Highly recommended, very nice property, 4.5 stars. This is not a Ritz Carlton but it's got a great location, the unit was amazing, and the ocean views and breezes were to die for! We had a lovely Vacation Experience the Resort/Condo was very nice. The room over all was clean and had ample kitchen supplies. 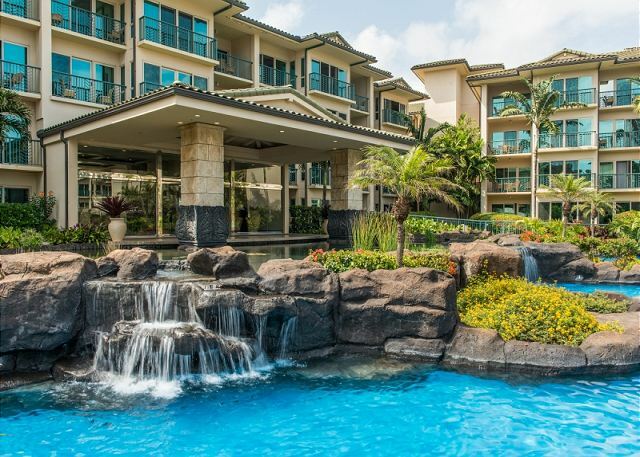 Good central location to drive all over the Island, really good restaurants in walking distance, and the Bike/Walking path was just outside the Resort/Condo fantastic walk to jog to take in breath taking views daily. Over all a fabulous location- Only draw back, please make it easier to get into the pool area to get towels, People are on Vacation and so is their brain--to many numbers for the pool code. WOW! A great condo with two king suites! 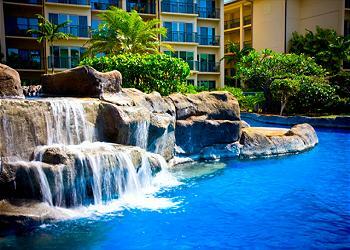 When planning our two week trip to Kauai with another couple, we had certain desires when it came to lodging. We were looking for two master suites with King beds, ocean front , and a pool. 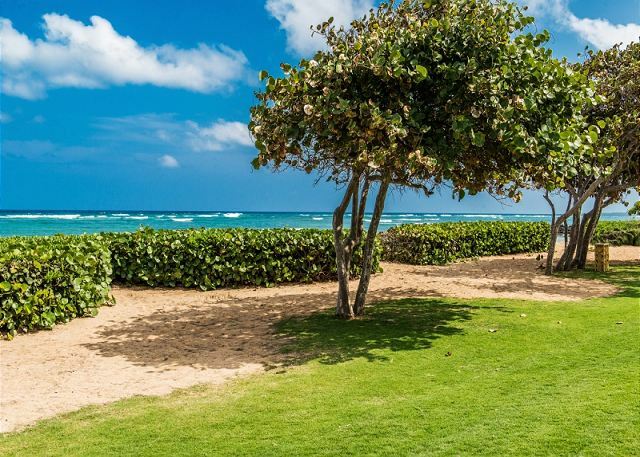 Waipouli Beach Resort and Kauai Exclusive were the answer to our dreams. H302 has 2 King beds, a great kitchen, and a fantastic view! The resort has great amenities. Kauai Exclusive Management was great to work with. Easy communication, prompt answers, great instructions for arrival. We liked being able to go straight to our condo without having to stop by a check in desk! 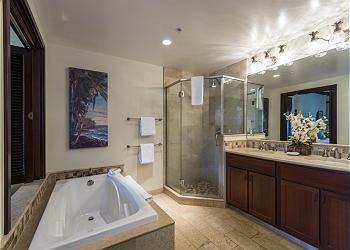 We will use VRBO again, and recommend Kauai Exclusive. 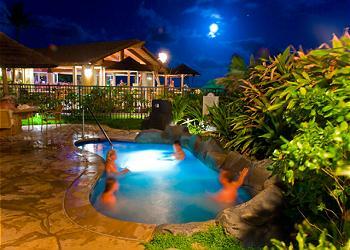 We were very pleased with our stay at Waipouli Beach Resort. Our 2 bedroom condo unit was very clean, attractive and well maintained. 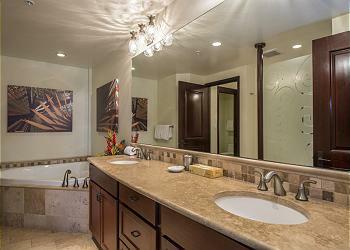 Loved the layout - especially the bathroom. The bonus was that we had a corner unit that overlooked the ocean from 2 different views. We enjoyed the patio situation greatly. The staff were very helpful, very nice people and liked having the Oasis Restaurant right there. It offered good food. The Safeway and other stores were located right across the street - making food shopping very convenient. Once you are into the resort area you would never know you were in the midst of a high traffic area. We were very pleased with our stay here. We enjoyed the rental. Great views, location. Rental was clean and well maintained. Only issues were the following. Light in the bathroom. It is on a sensor and it would come on 4 to 5 times a night. This would wake us up. I did call and they sent a maintenance person out. He said he had already replaced it and it should not be coming on at night. I guess we don't know what we are talking about. Also at same time reported that one of the toilets would not flush so we had to take the top lid off to make it flush. This was also not fixed by maintenance. Only other issue was the adult spas at the pool. Parents would let there kids sit in the adult spa. Mentioned it to staff and they would not address it. My question is why have adult only spas if Waipouli will not enforce. Overall these were minor issues. We would definitely come back. 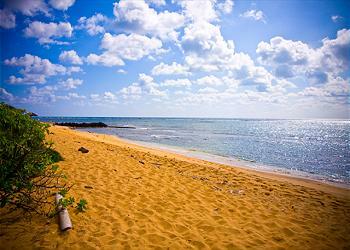 Waipouli beach resort is in a great location and has excellent amenities and is well maintained. The unit was as promised and everything was very good! Great family vacation, third visit to this resort. We rented two condos from Kauai Exclusive, they were wonderful. Shawn and Sherry are "on the ball". View is not OCEAN FRONT, but it was still beautiful. Friendly quests and comfortable accommodations, felt like home. 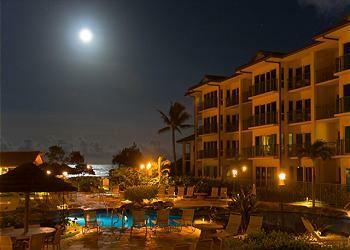 We had a wonderful stay at the Waipouli Beach Resort Condo. 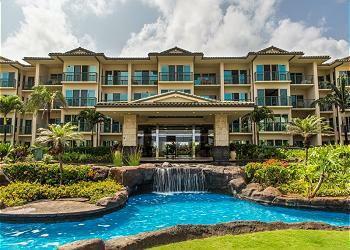 Kauai Exclusive made check in and check out so easy and convenient. The condo was beautiful and comfortable. Very nice!! We had some issues with a problem door and the AC, but Kauai Exclusive was responsive to the problem and it was resolved. 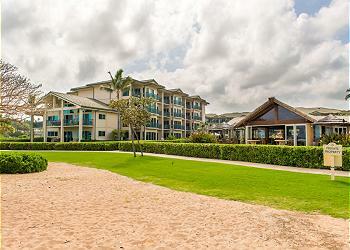 We had a very pleasant stay in unit H302 at Waipouli Beach Resort. The location, the unit, the management company - PERFECT! From the moment we booked our rental till we left we were happy! The rental company took very good care of our needs. The unit was immaculate and has such an amazing view each day! We will definitely be booking this unit on our next trip! Kauai was the last island that my husband & I visited on our 14 day Hawaiian honeymoon. 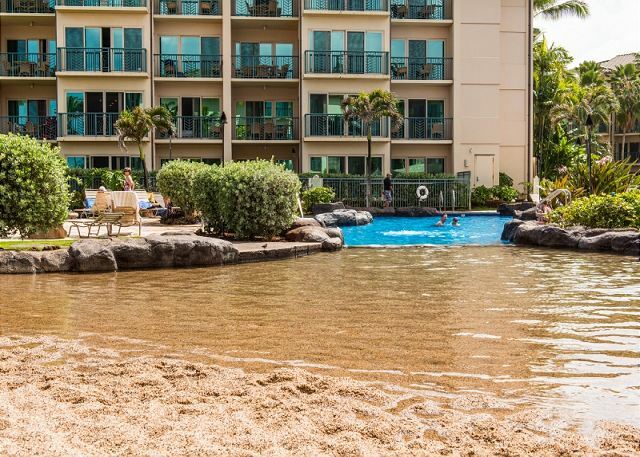 We knew we would be ready to kick up our feet by the time we landed in Kauai, and we are so glad that we rented H302! The rental was extremely spacious, comfortable, and offered picturesque views from sunrise to sunset (we were lucky to watch a full moon glow over the ocean during our stay). The rental is conveniently located to 2 grocery stores and offers a large, open kitchen for preparing meals. If you are not a beach bum, the Waipouli Beach Resort pool is something else! 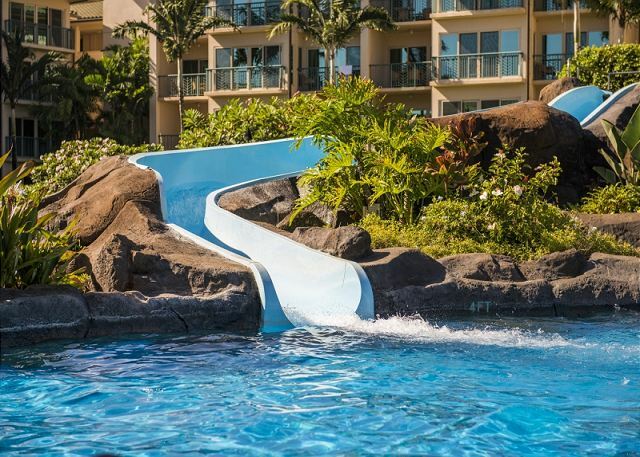 As an adult, I had too much fun going down the pool slides into the refreshing pool. The only thing I would have fixed is that I did not receive the check-in instructions until the day of our arrival; however, the management company was responsive and apologized for the delay. I will definitely consider H302 when my husband and I return to Kauai. Great location and the layout of the unit was awesome. The hallway was stuffy due to poor airflow and/or lack of AC. There were large patches of paint peeling on the exterior of many of the units. Waipouli is a fairly new 200 million dollar resort and like any big project there are always a few items that contractors need to come back and resolve. Unfortunately our exterior finish has failed and will need to be repaired. It does not look good in the CLOSEST ocean areas like H302. We rented Unit H302 for a 6 night stay in Kauai. The pictures looked great but you never really know what a place will be like until you actually get there. The condo and the view fully met and exceeded our expectations. Only 2 hiccups: Knives need to be sharpened or upgraded and check on ice maker and ice box- cubed continually melted together ??? All else was great. Absolutely Fantastic Condo and Resort! We loved our stay at Waipouli - we are already planning our next trip! The location on the island was fantastic - so close to everything. Having Safeway and Foodland across the street was a great bonus, pick up something fresh afternoon after a day's adventure and then use the Resorts grills. Our girls aged 7 and 9 loved the pool area - especially the slides and caves. It felt a very safe, family orientated, clean resort. The condo (H302) was superb - clean, massive and incredibly well stocked kitchen with every utensil imaginable. Great condo, but the read the fine print in the contract. Unit H302 was a great place to stay, with fantastic sunrise and moonrise views. It was within steps of the beach and one of the best restaurants on the island. It was not, however, the unit we originally booked. At some point well before our trip and without notice we were involuntarily reassigned from that unit, A206, to H302. This is something we were informed the contract allows at the owner's discretion, although it is implied that this is only done in very limited circumstances (sale of unit, damage, etc.). When contacted, the agent apologized and offered us a discount for the stay which we accepted. All in all, the switch was fine, but they really ought to better explain the possibility of reassignment to renters, and whenever that occurs. 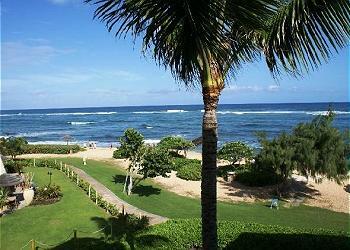 All other aspects of the stay were fine, and the resort is nicely situated between the north and south ends of Kauai. Sonja, the agent's concierge, was excellent to work with for restaurant recommendations and finding us the best helicoptor tour. All in all we would return to H302, but only if we were assured that we would not be involuntarily moved to another unit without our knowledge or permission. The unit was the perfect size and well cared for with a fabulous view! The rental company was responisive from the time we engaged them to final checkout. They were personable and knowledgeable and we were so pleased we rented through them. I heard a nightmare travel story from someone I met at the pool who did not use them and were displaced for three nights of their vacation. The management company was excellent to deal with; very informative and available. The room was exactly as pictured. The beds and pillows were the best I have ever slept on. The grounds were beautiful and very well maintained. I would stay again. Beautiful , clean apartment,nice location,front row to ukele concert. Negative,bed and linen not comfortable, too close to oasis restaurant, no privacy for dinner on terrace, no other dining table. We stayed in H302 for 8 nighs. The unit was perfect for us (2 couples each wanting a king suite), beautiful, and very clean. The view was amazing and we had perfect weather during our stay. Really loved the location of being in the middle of the island. Grocery right across the street. Loved the bike path and area restaurants too. All around great experience for us! We stayed in H302 for 10 days in early August 2014. I've stayed at Waipouli 6 times and this was by far our favorite condo in the resort. The view is absolutely stunning. We enjoyed eating breakfast, lunch, and dinner on the balcony. We had our 20 month old daughter with us and I was so happy the balconies were safe for her. She loved walking on the small one in front of the living room, watching people at the pool. The condo was well appointed with everything we needed to cook. It even had Keurig cups for the coffee machine already in the condo. Plus, the condo had laundry detergent for our use. It also had a good selection of beach chairs we enjoyed using. The beds were incredibly comfortable as well and the towels were so soft. The only negative to this condo is the parking. We never got a close spot, but Kauai is absolutely stunning, so walking a little farther is a bonus. The condo is located across the street from Safeway and Starbucks, so walking to get your food and coffee is easy. Kauai Exclusive was wonderful to work with. They helped me coordinate with a company to get a crib and it was set up in the condo before our arrival. It was so convenient. We return to Kauai every year and plan on renting H302 every time. Beautiful stay in a prime location! We had a really great experience, right through from booking to arrival and of course the unit itself. Great location with beautiful views. 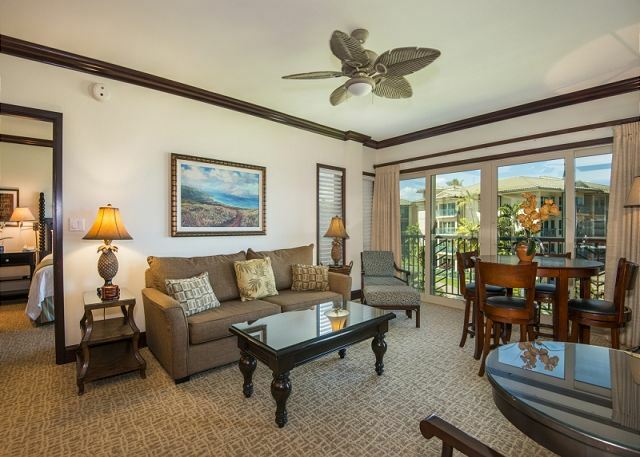 Really convenient in terms of amenities nearby as well as accessing the whole of Kauai. We ended up doing so many activities outside of the resort that it would have been great just to have a few nights to relax and unwind on the property itself. Beautiful place to stay and catch morning sunrises! Our family had a wonderful time in this true ocean view retreat. The accommodations were first rate and exceeded our expectations. I highly recommend this resort and unit. This was the second summer in a row that we spent in Kauai at the Waipouli. We had such a great time during the summer of 2013 that we did it again in July 2014. We travel every year with good friends of ours and only stay at the really nice places. 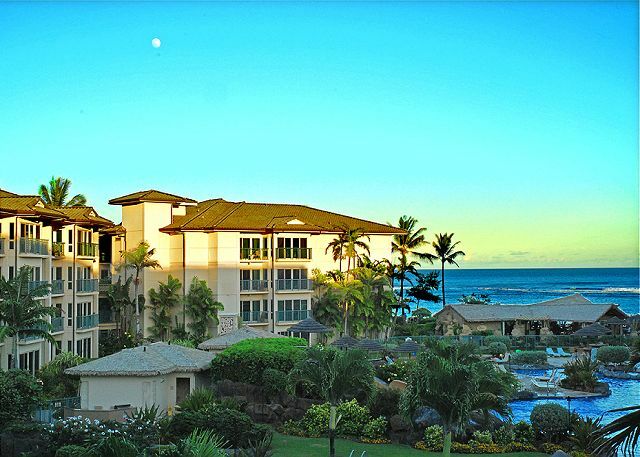 Waipouli is as nice as any of the high-end resorts on Kauai, Maui or Oahu. And we have stayed in many of them. And of course Kauai is just beautiful. Kauai. Joshua and Sonja at Kauai Exclusive Management are first rate. Sonja was like our personal assistant. She just took care of everything and with such a great attitude about life. Then again she does live in Hawaii. Anyway, thanks for another great vacation in paradise. We met in Kauai with our 3 adult children and their partners (and one grandbaby). We rented 2 adjacent units. This was a great way to spend a family reunion. We explored Kauai (first time for all of us), played in the pool, played games and ate together. The units were great and questions were answered very promptly. Amazing view and room! Def worth the money! Even stayed an extra night! Plan to come back! 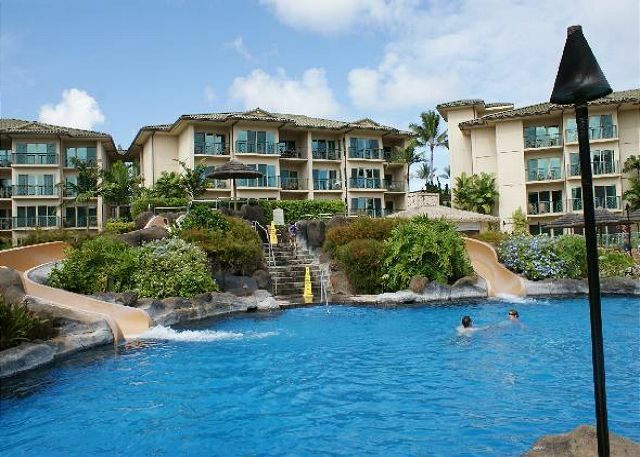 This was our 3rd visit to Waipouli but the first using an owner condo. By using the owner's unit, you can pick the exact view and amenities. This unit is awesome with its furnishings, televisions, and is so well stocked with chairs, cleaning supplies, vacuum, toilet paper, paper towels, soap, etc. The view is amazing and the unit is in excellent condition. The dedicated internet is the best and fastest and can be received even out at the pool and beach. The rental company did a great job and the extra air bed was very comfortable. This unit is the only one I would ever stay in on a return visit to Kauai. The pricing is the same as Outrigger but you get to pick the exact condo location. Have fun in a heavenly resort and condo. This was our fifth visit to Kauai in the past seven years and once again, we chose to stay at the Waipouli Beach Resort. The exterior of the complex looks like it is in need of some paint and plaster repair; however, the interior of our unit was excellent, as always. 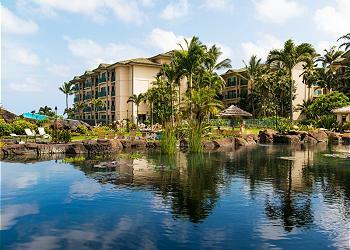 We enjoyed our stay as much as ever and will most likely return to the same complex next time we visit Kauai. non residents out of the pool area. There are so many beautiful beaches within driving range that it never once bothered my teenage kids that they could not swim on the local beach. Spent most of our time boogie boarding at Brennecke's, surfing at Hanalei, then returning to hotel in afternoon for a relaxing swim/float in the lazy river. Everthing is a 30-40 minute drive from Waipouli. It would have been worse staying e.g on North Shore , having to drive all the way down to Poipu. Had quite a bit of cloud when we were there, but would drive to Poipu and spend a wonderful day in the sun. On the nice days we could easily drive to Haena or Hanalei. Can absolutely recommend this property - will definitely return without even looking at other rental options. Unit was top notch. Would recommend to anyone. Unit was extremely clean and well cared for. The location in the complex was outstanding. Could see pool area as well as ocean. Was an outstanding vacation. This was the second suite we stayed in at the Waipouli. Amazing. We'll be back for sure. Just loved it. We had a couple of minor maintenance glitches, BUT Josh and Sean were incredible! They were responsive, helpful and easy to work with. 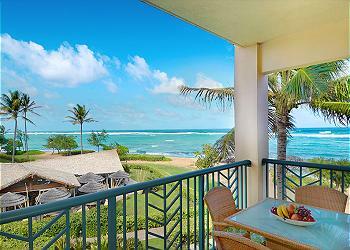 The condo is in an ideal location, the views are among the best in the resort. The owners obviously want to make the condo the best they can and solicited suggestions to improve the next guests' stay. A wonderful vacation spot! Would DEFINATELY, without hesitation, stay there, in Unit H302, again! This vacation experience was relaxing and carefree. Everything was perfect! The property is located in a very convenient location. Safeway, Starbucks, Longs Drugs is right across the street along with other stores. The condo we stayed in was very clean and there were no issues at all during our stay. Although we did have some issues with the internet connection but it resolved itself after about a day. The grounds are beautiful and very well kept. I would highly recommend this resort to anyone. Looking forward to our next vacation! Absolutely wonderful. Already planning next year in same unit. 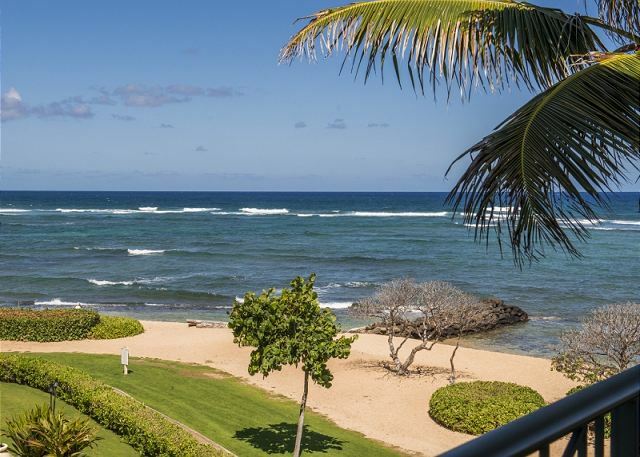 The Waipouli Beach resort is a must stay if you visit Kauai. It's in a perfect location, near every amenity you would need, and the staff is extremely responsive to your needs. 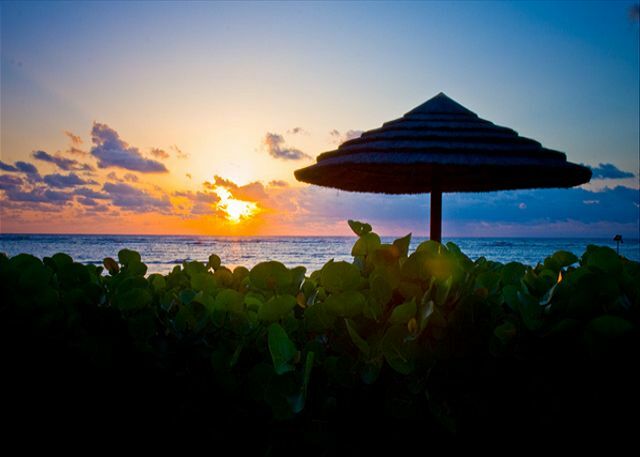 The resort itself is beautiful and the unit provides the perfect location for a sunrise and sunset that you've only imagined. 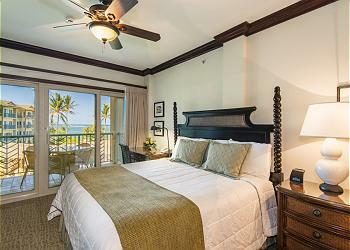 When visiting Kauai I'll always stay in H302 at Waipouli Beach Resort and Spa! Love this unit. This is our 3rd time at Waipouli and this was our favorite thus far. Few bulbs out that they never replaced during our 4 night stay. Dryer didn't work but they gave us a different unit dryer to use each night & credit at Oasis restaurant for our inconvenience. The resort is amazing and the property management company is also great. H302 is a great condo. Perfect for our family or four with older teenagers. The place was beautifully furnished and spotless. The A/C, appliances, TV and everything else in the condo worked as expected. Perfect size kitchen and very comfortable bedrooms. We stayed two weeks and it never felt small or cramped. Great view. Our mid-stay cleaning got skipped by accident and KEM fixed that right away. No problem. Also be warned that there are occasional events at the Oasis restaurant that can get loud, but quiet hours are respected so it was fine. Plus one of the events included a fun Hawaiian dance demonstration that we enjoyed from our balcony. H302 is 5-Star Plus. This property is amazing! It was in a great location with a convenient grocery store and several restaurants within walking distance. The condo and associated pool and restaurant are as amazing as the pictures. 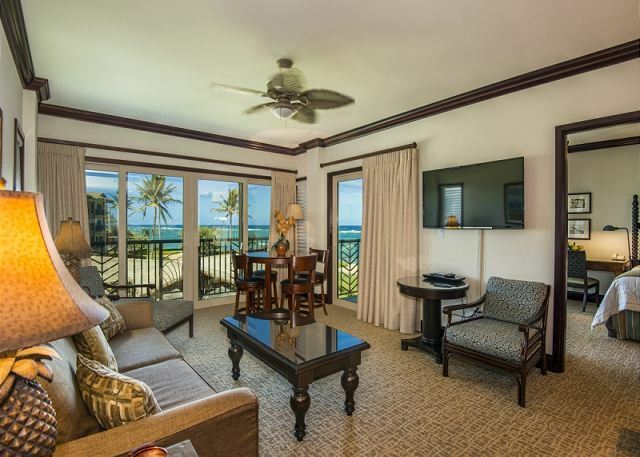 H302 has one of the best lanais in the property. No surprises here and a very professional management team. Unit layout was great for 2 couples.Kitchen is beautiful. Had a problem with the dryer not working--very erratic. Had to leave wet towels in the dryer when we left for home. I don't think maintenance every came to fix it while we were there. Loved the location & view of ocean. Had a monk seal beach for the day while we were there; she returned to the sea by a.m. So neat! Overall, a wonderful stay. We were very pleasantly surprised with the complex. Our unit was perfectly represented as well as stocked for every possible need. It was a refreshing change after spending part of our vacation in a minimally stocked condo on another island. We loved having shopping across the street and a great restaurant downstairs. I would highly recommend this location. CONDO WAS BETTER THEN EXPECTED..SUNRISE EVERY MORNING FROM LANAI..POOL VERY NICE, AMENITIES WERE ALL THERE, RESTAURANT ON PROPERTY NOT VERY GOOD CARRIES FOOD FROM A DIFFERENTLY LOCATION, NEVER WENT BACK,,, WOULD DEFINITELY STAY AGAIN..WOULD HIGHLY RECOMMEND THIS PROPERTY AND KAUI EXCLUSIVE CO..
We splurged a little but the unit met all our expectations. What a view! Everything we needed was provided. I would definitely recommend this unit and property to friends. Highly recommended! Amazing view and great accomadation! We just got home yesterday from our Kauai vacation. 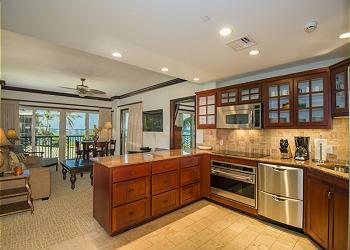 We had a great time on the island and were very happy with the condo H302 at Waipouli Beach Resort. 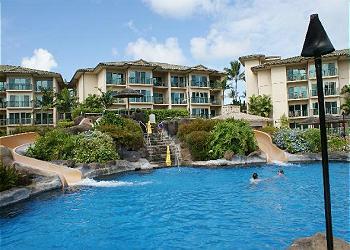 It's a great place for families as there is a pool with waterslides and a beach out front. The condo was very clean and had everything we needed. The view is spectacular and we spent a lot of time on the balcony whale watching. There is a palm tree right outside the condo so at night if you leave your bedroom door to the balcony cracked you fall asleep to the sound of waving palm trees and the ocean waves coming in. A truly Hawaiian experience. 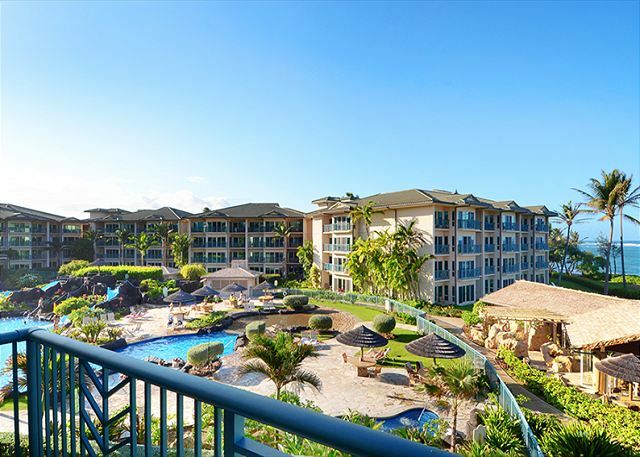 I would recommend this condo to anyone, the owners of this particular condo manage several condos at Waipouli Beach Resort, they were very professional and answered all our emails quickly. I liked the fact it was a VRBO rental over the resort rentals as I like the idea of not being bothered once I get on my holiday. They even allowed us to have a very late checkout as our flight wasn't until night and this was priceless to us as we have small children needed somewhere for them to nap and be comfortable until the flight. We have no complaints, the condo, the location, the island and the loving Hawaiian people were so amazing! A wonder family vacation! Thank you Kauai!!!! Had a beautiful vacation at Wiapouli Beach Resort. Everything was above and beyond expectations. Elegant furnishings, too many high end amenities to list. Central location. Fabulous pool complex. On site beachfront restaurant (Oasis). Full ocean and sunrise view. Much more. We had a wonderful stay. Would recommend it to anyone. Kauai exclusive was so accommodating . Loved the pool. Try the pineapple martini. Wow. Being right on the beach was the best. We loved staying in this unit it has a beautiful view and is furnished perfect. The kitchen had everything we needed. The property is the perfect place for a family with young kids we absolutely love it there and plan to return each year. we were 5 people, 2 adults , 2 teenage kids and a grandma. the place is really meant for 4 but even with the 5 was very comfortable. loved waking up with an amazing view of the pool and the beach every morning. From start to finish easy communication and arrangements with Josh! truly aloha!! Well appointed condo in practical location making it easy to travel to both the North and South shores. My husband and I had a great time at this hotel. It was close to everything and our room had a great view! superb...all we could have hoped for and more. The kids loved the pool, the condo was gorgeous! We had a wonderful time! The view was incredible - just steps from the beach, and the whale watching was amazing. Enjoyed hearing the ocean waves from our room. Loved it.... we hope to be back again soon! to go to. Overall we would stay again! We spent our honeymoon here and loved the great central location. Close to grocery stores, restaurants and on the beach. Beautiful unit. Had a problem with the AC and they fixed it immediately. Close to the airport and half way between north and south shores. Would stay here again. Immaculate apartment with a great view of the ocean! We were there to do some diving and outdoor adventure things and found ourselves driving most days to Poipu... About 30-45 mins away so we would stay down that way next time... Also it is a bit more rainy in this side of the island. BUT the apartment was so comfortable and relaxing with beautiful finishings that I would be happy to stay there again despite the distance! It is really close to the airport and easy to get to. There is a Safeway across the road which also hides a great little local restaurant with fab fish tacos! Basiclly once there you don't really need to go too far and at least from waipouli you can go north and south... So it is good from that point of view. There are some great restaurants up north too... So that is worth a visit. H302 is an end unit facing the pool area and the ocean. It was clean and fully supplied. 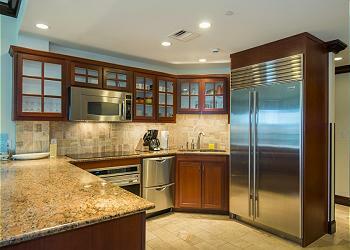 The appliances and amenities were in excellent condition. 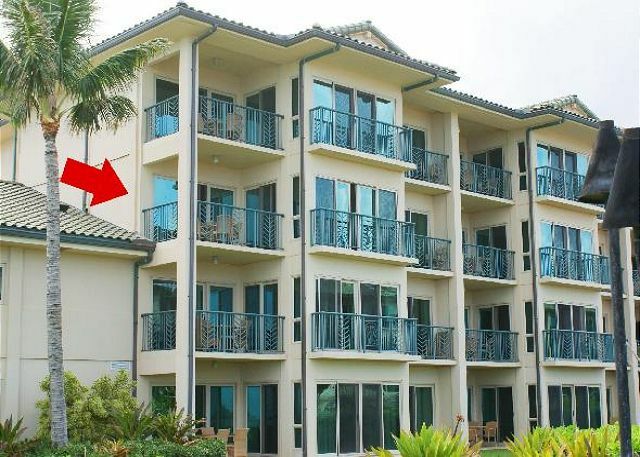 We had one of the best locations in Kauai for a condominium along with an excellent property manager, Josh Rudinoff. 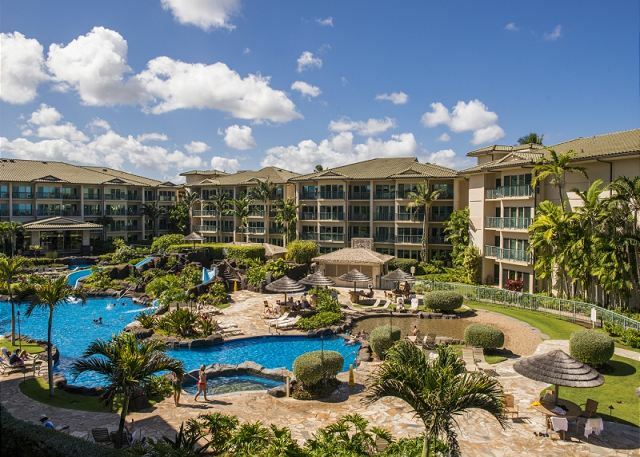 I must say you will probably not find a better quality location in all of Hawaii then getting the location at Waipouli Beach Resort and Spa. 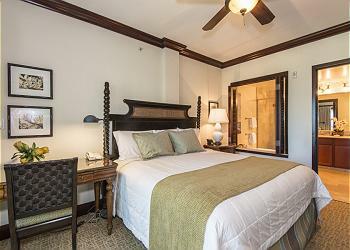 And Kauai Exclusive Management is an excellent resource to book the H302 room we had for our vacation. Thanks again guys, we appreciate all your help during our stay and we WILL be back!! Family wedding, held on the beachfront. Fabulous for multiple families and friends to celebrate the occasion. You never quite know what you are going to get with a condo but this was "one out of the box". The apartment itself was great and the resort equally as impressive. 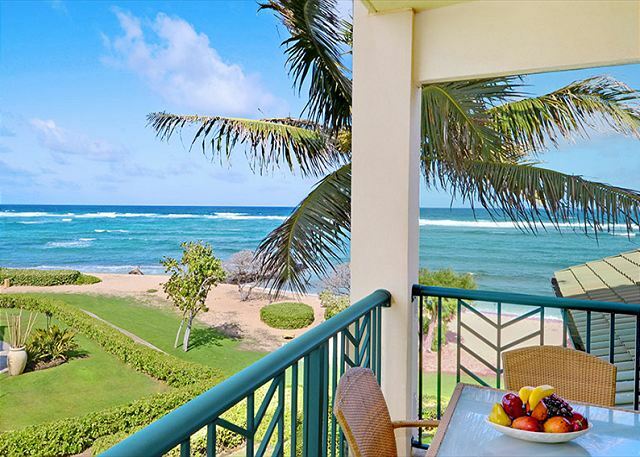 Our apartment was well stocked, had everything we needed and it was tremendous having breakfast out on the lanai each morning, looking out to sea. Only small criticism was that there was only a two person table to sit at in the apartment, so pretty hard to work for a family of four, but in the overall scheme of things, not too bad. The big attraction for us was that over the road, there was a really well stocked supermarket that had everything we needed. Easy walk up to Kapaa, for the shops there. Our first visit to Kauai but hopefully will not be our last. We travel quite a bit and there haven't been very many occassions where we are absolutely WOWED by an accomodation. The pictures are typically much better than the residence, but H302 was much better that we had expected (or experienced before). The property was extremely clean and well-presented inside and out. The staff were very friendly, and the quality of food and service at the restaurant was exceptional. Yet the best part about this vacation was that we were treated so well (from beginning to end) by Josh of KEM. He delivered on every promise, and was available 24/7. Just a great all around person with lots of info and advice. Thanks to you, Josh, for really making our latest vacation perfect! I can assure you that we will see you again soon. I can't say enough about how beautiful the Waipouli Resort is. No one will be disappointed! had a great time very convenient.